I went to my favorite junk shop yesterday. I just made the trip a few days ago but couldn’t resist taking another run yesterday. The weather was beautiful and I enjoyed the 45 minute drive. I found a treasure and I need some input from you guys. How pretty is this bed?? I fell in love with it at first sight. 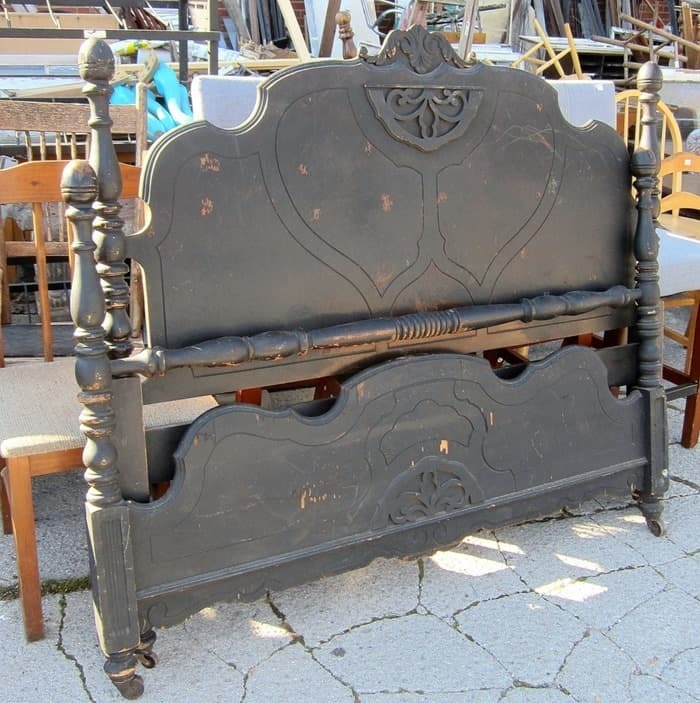 It’s hard to find vintage furniture with pretty wood details like this bed has. The price with rails was $25. I couldn’t say no to that deal……a steal. Mr. Butler (the shop owner) searched through his inventory to find a set of rails to work with the bed since the original ones were missing. In this photo they look like they match but the rails are a lot newer than the headboard and footboard. The hubby and I will have to cut more slats for the bed. I took more photos after I got it in the workshop. 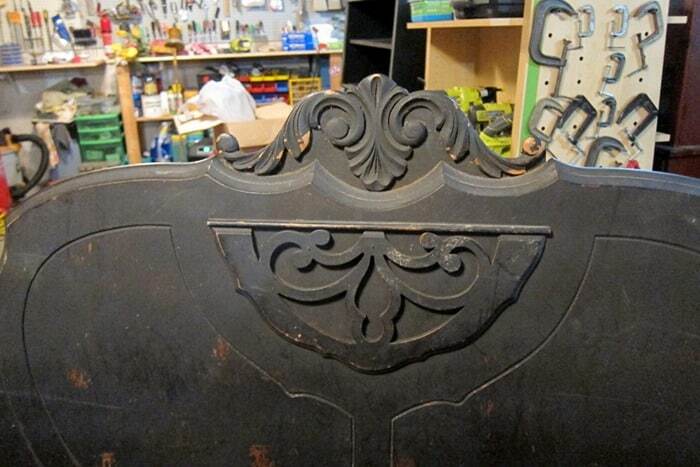 You are looking at the backside of the footboard in the photo above. The veneer is really rippled along the bottom with some of the veneer missing. A bit of veneer is missing on the front side of the footboard but not much. The biggest issue is with one of the legs…..or feet. It has been repaired in the past and it definitely shows. Plus there has been additional damage to the repaired area. 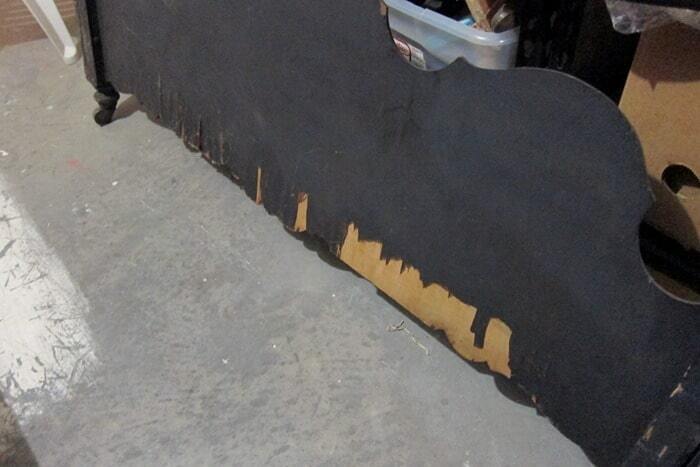 I’m hoping we can fix it up where the damage isn’t very noticeable after the paint makeover. 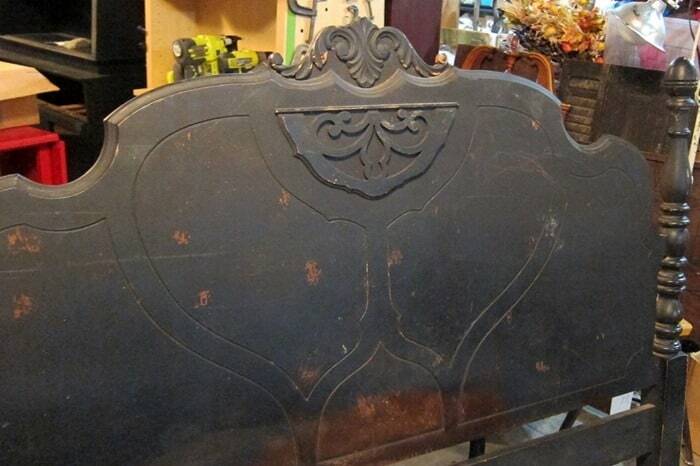 Let’s take a look at the headboard. 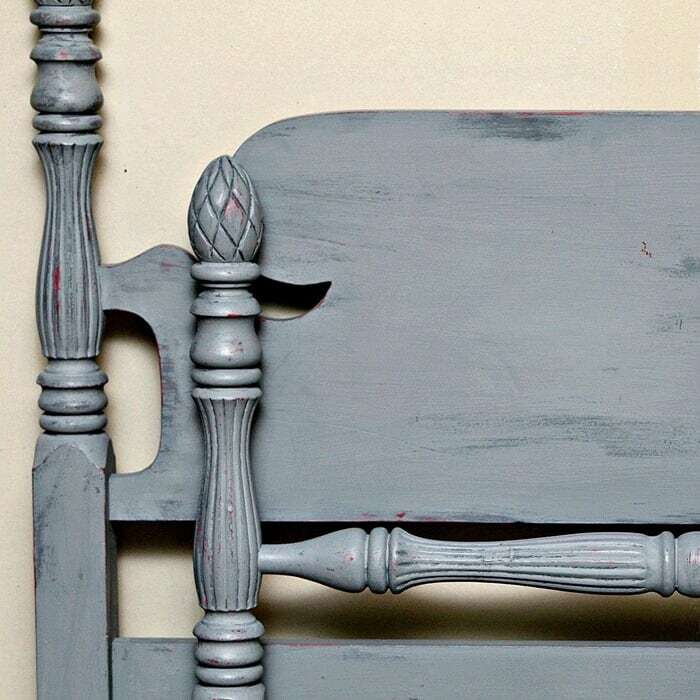 The bed was painted or stained at one time. This is not the finish the bed started out with. In the photo above you can see the original finish toward the bottom of the headboard and also in the rubbed or “distressed” areas all over the front. But don’t you love the detailed wood appliques. 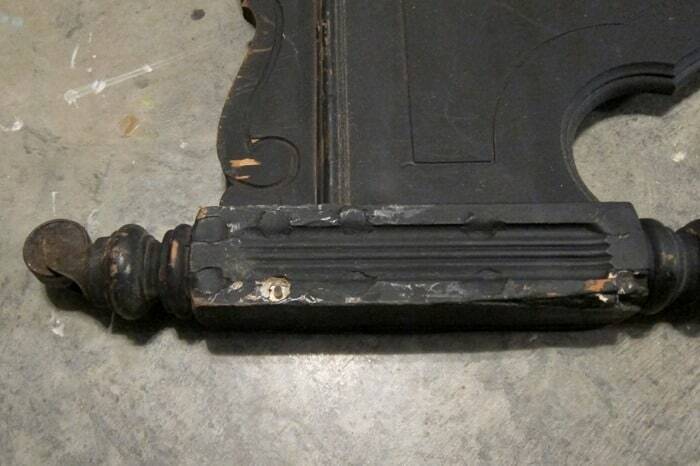 The appliques are for the most part undamaged which is a plus. These pieces are usually broken off in several places. Now that you’ve had a good look at the bed it’s time to talk about how I’m going to paint it. I was thinking about gray or maybe gray with a brown tone (warm gray). Next I decided to search Pinterest for paint color ideas. This bed caught my eye right off. Sorry the photo isn’t bigger. 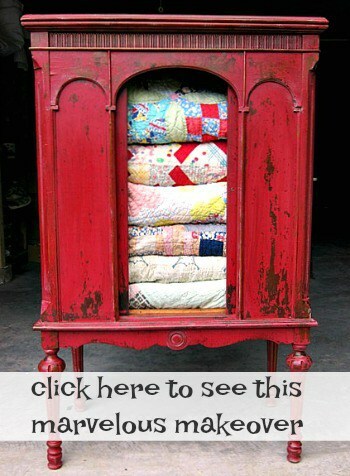 That photo link on Pinterest just goes to this small image with no other details. The blue color is beautiful. Too bad I don’t know what it is. 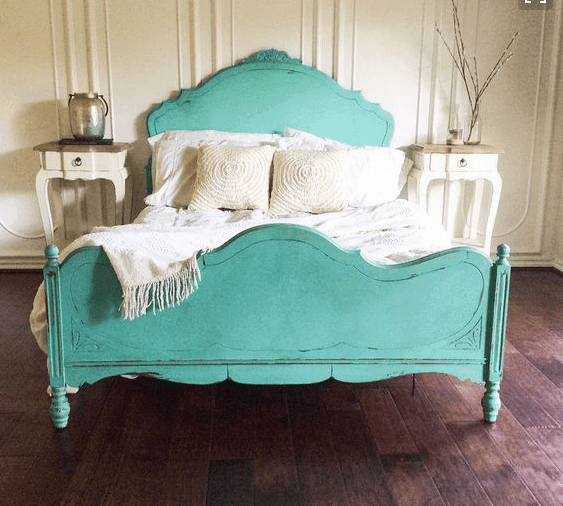 I could try painting it like this antique bed I painted a few years ago with a custom milk paint color. But you know what they say…….it can’t be repeated. I believe that. I could still go pink or soft rose if I find the right color. The details on the bed make it feel feminine. I also like this turquoisey blue. You guys know that whatever color it ends up being the paint will be distressed. That just goes without saying. 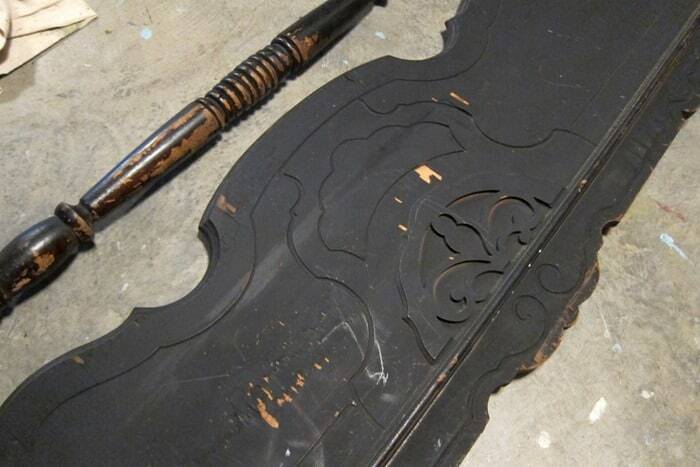 The lovely wood details have to be distressed. This is the twin bed I painted a year or so ago. I used a simple layering technique using Vaseline. You can see bits of pink paint peeking through in several areas. 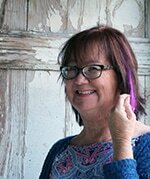 I could go with a gray similar to this one but I think if I go gray it will be a warm gray. You find absolute treasures! 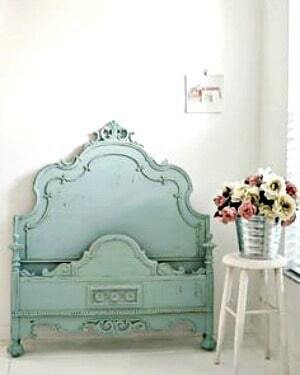 I was imagining it with peach, grey and off white chalk paint. I like the first one the blue aqua one. Love the details on this bed. I love 1st pinterest one! 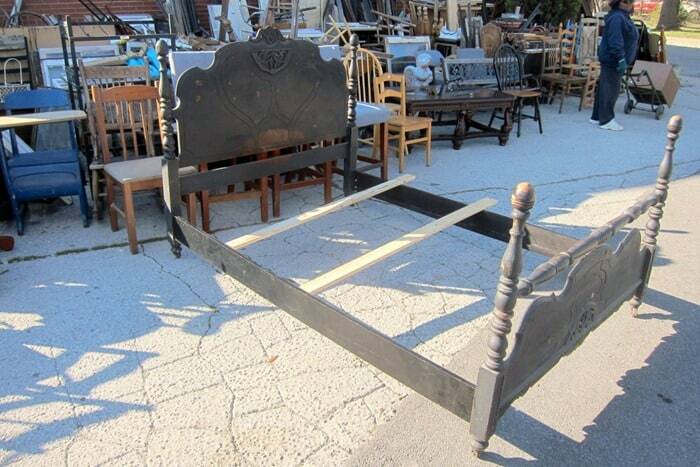 Do a Pinterest search for French beds. Lots of good ideas there. I would keep it light with either a pale blue, pale pink, or white. It should also be distressed. Great find! yep, the blue/green color in pinterest photo is it. To me, this bed and design calls for a nice white with light distressing. It may not be a big pop of color but is crisp, classy and easier to sell if that is your intention. With a white bed the choices of linens is endless! I absolutely LOVE the fist one!! Maybe you could find a color similar? 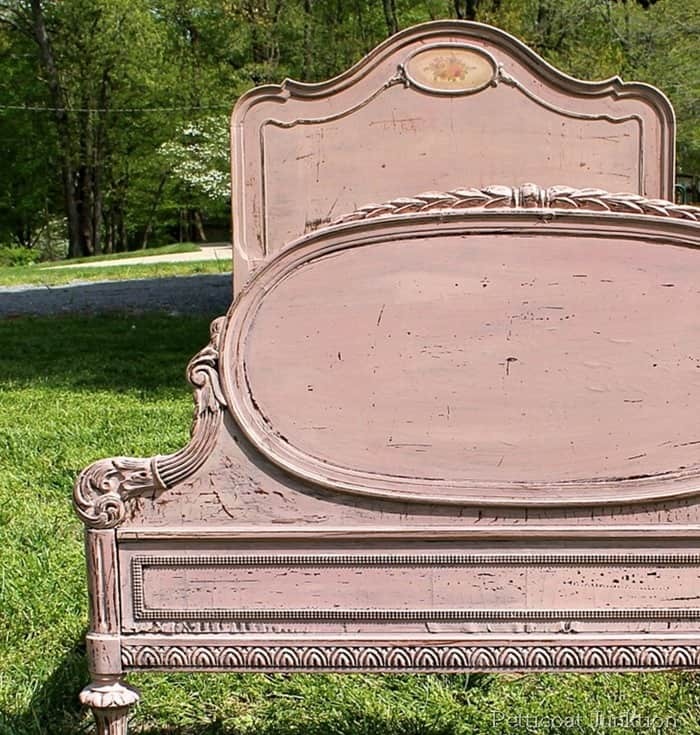 I like the softer colors for this bed, rather than bold, to go with the intricate detailing. Can’t wait to see you work your magic!! The bed is a beauty in waiting. A mint green, turquoise or light blue would be my choice. I’m sure whatever you choose will be gorgeous. I love the idea of a gray/silver! I recently painted a condo using these colors and love the look! Wow , what a pretty bed . Lots if repair but I know you can handle it . I , too , love the color in the small Pinterest ad . It’s too fancy for a boys room and any little (or big girl ) would love that color ! Can’t wait to see it finished . The detailing is in great shape and that’s a blessing ! Good luck ! I love the small Pinterest pic. Its like a breath of fresh air… So beautiful! Looks like duck egg color? My first thought was pale pink because it looks so feminine. But I love the turquoise and light blue also. NO to gray, this bed is a little fancy and needs a fancy color. I love the turquoisey blue, but if you are planning on selling it, I think a gray would get a larger audience. What a beautiful piece. What about a Robin’s Egg blue? hi, i do love anything that ranges from pale blue to aqua. this bed has beautiful details! do. you ever use any. filler on parts like if the damaged veneer were cut out. and then filled and sanded? if so, do you have any posted instructions or projects? love your. work. thanks. The blue colour in the small Pinterest photo. Definitely! A lovely blue gray with white glaze would be beautiful! Palest turquoise…… lightest distressing….. and finish of with some of that antique finish paste in silver to highlight the pretty bits. Good luck, look forward to seeing your end results!